Secure Share is a very interesting project that aims to replace existing social networks with a far, far more secure platform upon which developers can build new distributes apps and services. Think of it a bit like a new version of Bit Torrent with an easy API for sending messages, relationships, streams, and status updates, and a prototype desktop client for bringing these together in a social networking interface. The Secure Share team seem to be correct in their core beliefs that Federated networking is part of the privacy problem rather than the solution, and that the web browsers are incapable of delivering secure communication. They certainly appear to know what they’re talking about, and the amount of research and planning evident in the many articles on the website is impressive. 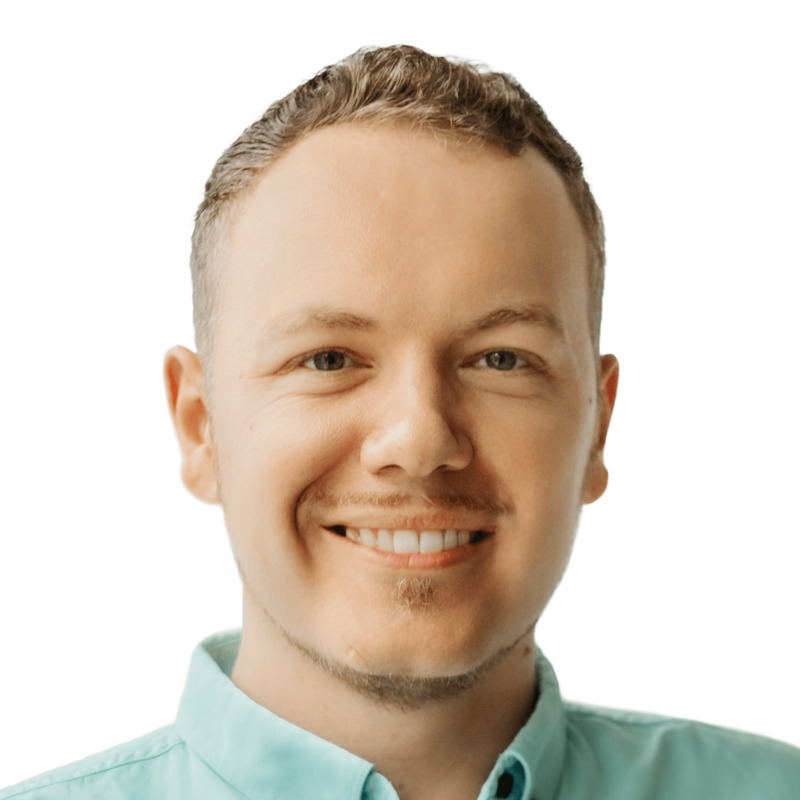 The project lead, Carlo Von Lynx, has promising talents, with a background in security and scalability (compare this to the team that founded diaspora). Code already exists, mainly for the back end libraries and daemons. There is a user interface component, but it hasn’t been worked on since April, and it’s intended to be a desktop social network app, which may be impractical for most users as it requires local installation. All in all the project feels more like a research project than a software project at this stage. Presumably their recent requests for funding is intended to ease the transition to usable software. I’m very sceptical about the requirement for Secure Share users to install something on their local machine. In a time when Google is determined to turn all consumer computers into thin clients, and the web browser is becoming “the only app you need”, it seems unlikely that the future social networking app used by “all humanity” will run from a binary downloaded from secureshare.org. Secure Share developers also don’t seem certain how it would be possible for their users to access their accounts on more than one machine. Being able to login from university, or on a friend’s laptop, seems like a critical requirement however. There’s some vague talk of using Secure Share on smartphones, but if this is to become a reality then surely it should a priority right from the start. Making smartphones a primary target platform seems like a no-brainer now that they outsell traditional personal computers. It seems to me that Secure Share is a long term project with a lot of intellectual value, but comparatively little practical potential, unless it receives a lot of interest and funding. Diaspora had $200,000, and what they achieved was approximately 5% of what Secure Share have in mind. That said, Carlo is a heck of a lot more capable than the Diaspora developers, and he’s already written a significant chunk of the Secure Share back end. Secure Share is also a second-generation project, building upon successes of the Psyc project, showing that those involved know how to deliver production quality applications. I have high hopes for Secure Share. If it becomes user-friendly and feature-rich enough, perhaps it could lure developers into taking it to new platforms, and users into jumping ship from Diaspora, and maybe even Facebook. I wish the team the best of luck. Gtimelog is very simple. It provides no method of editing the log of how your time was spent. Fortunately the program’s simplicity extends to its system files, which encourage easy manual editing, without the need for a separate interface for doing so. The file format of log files benefits from some explanation however. In Gtimelog click File -> Edit timelog.txt to view the log for the current day. Each task has only one time associated with it, and that is the time that the task ended. The time that any given task started is taken from the end of the preceeding task. In the above timelog.txt, the eating of spam commenced at 09.00, and ended at 12.00. 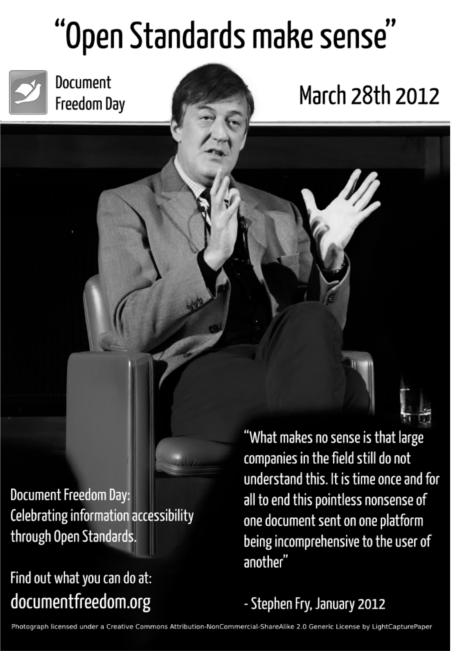 Two thousand A2 posters of Stephen Fry advertising Open Standards and Document Freedom Day have arrived! I will send these posters on to people who can use them all over Europe. 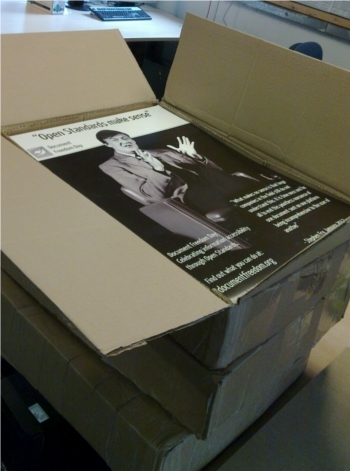 Only 1.5 weeks remain before the big day – please let me know right away if you can receive some posters! Contact samtuke () fsfe dot org . Anywhere else that you can think of! SONY’s new hand-held console is riddled with Digital Restrictions Management (DRM). Both hardware and software are built to control what consumers can do, requiring large and frequent payments to SONY in order to experience the features the PS Vita advertises. As the SONY marketing machine focuses its powers on children and young adults in their homes and schools through the usual multi-million dollar advertising onslaught, I thought I’d highlight the ways in which a new generation of gamers will have their freedoms taken from them. Will PS Vita owners grow up to assume digital media will only ever work on a single device? Will they come to see cross-platform, cross-device compatibility of applications and protocols as a historical ideal? Some of the restrictions below are well established in SONY products. Disproportionately priced, product-specific removable flash memory with inbuilt DRM has been a company staple for more than a decade. Some of the measures are new however, like the various systems which enforce a strict single user per device policy. This initiative is eerliy familiar to anyone who has read Richard Stallman’s short dystopian story from 1997 ‘The Right to Read‘. Furthermore it is amazing to me that on top of these restrictions, SONY still hasn’t added support for Free formats and standards like OGG and HTML5 video – these are well established within the industry, and free of both copyright and patent concerns for companies like SONY. The combination of willful product restrictions, and the lack of Free and Open elements results in a consumer product that is as anti-consumer as anything SONY has produced. 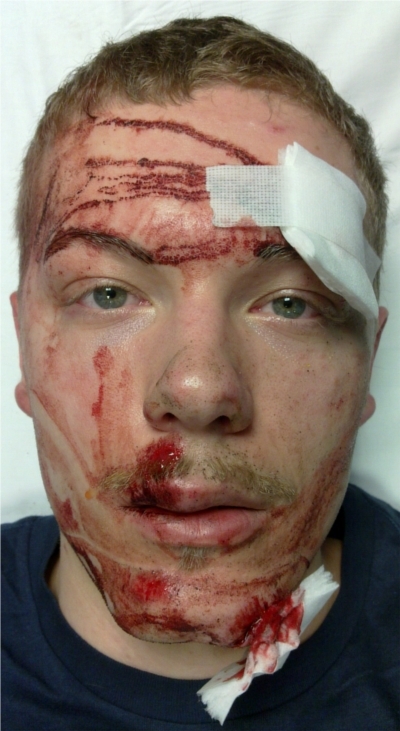 So, I got hit by a car on Monday while cycling home. It was dark and raining, and I was in the cycle lane about to go straight over a junction when a car turned left into my lane and into me. 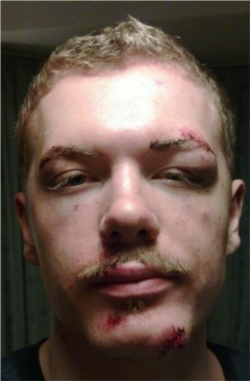 I went over the handle bars, possibly over the bonnet, and landed on my knee, shortly followed by my face. I was on the tarmac for about an hour; a small crowd, three teams of medics and a GP helped to check me out, cut off my clothing, and get me onto a stretcher and into hospital. I came out several hours later with nine stitches in two wounds, crutches, bandages, and 0.5 less of a tooth than I went in with. I’m returning to work gradually and may take longer to reply to emails for a week or so. The whole experience was rather a shock, but things are slowly returning to normal. 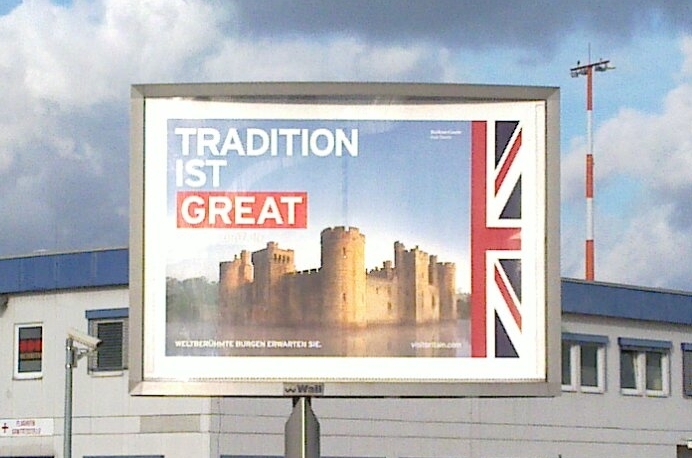 Last week I travelled from Liverpool to Berlin for three days to step up preparations for Document Freedom Day 2012. 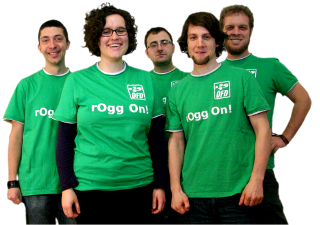 I arrived on Tuesday afternoon and went straight to the FSFE offices. Over the next two days I had meetings with other Document Freedom Day organisers, added a new web page, two new features, and fixed several other bugs.